Since 1989 – Floating Goose Studios Inc.
“As long as I can remember I have been an avid fan of the Port Adelaide Football Club, and consequently an obsessive knitter of all things black, white and teal. Each week the PAFC Cheer Squad come together to create the team banner, erected on match day for the team to run through in a ritual practice of solidarity. Fans are notoriously prolific producers, and through craft practices they are able to engage in their fan community in a tactile, creative way. For Since 1989 I have created my own banner, in an act of obsessive devotion. 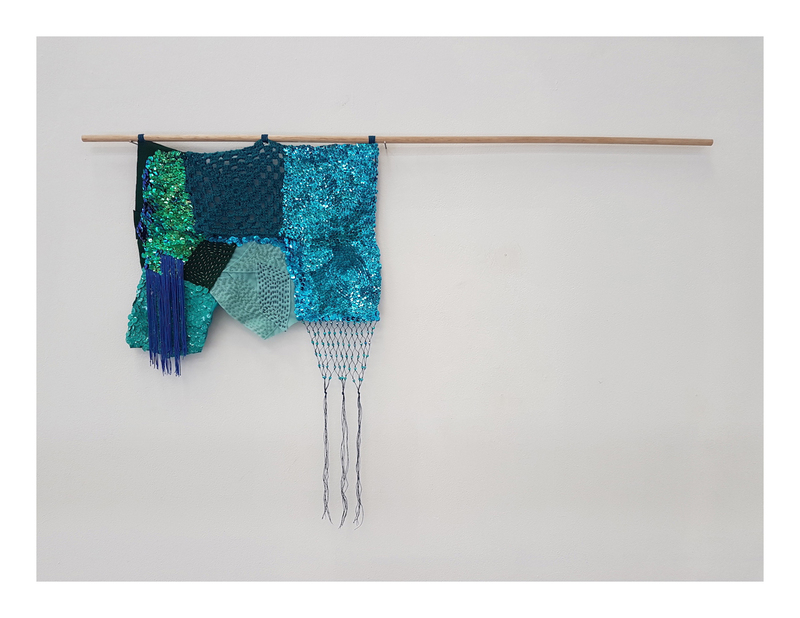 Carly Snoswell is an emerging Adelaide artist exploring fandom and the creation of craft objects as an ode to particular pop-cultural phenomenon through gendered and laborious forms of craft-making. In 2012 she graduated with First Class Honours at the South Australian School of Art and since then has exhibited widely including internationally. Snoswell was Co-Director at FELTspace ARI and has participated in studio residencies in Adelaide, Melbourne, India, and New York with upcoming residencies in Japan and Iceland. She is currently completing Masters by Research at the South Australian School of Art, is a member of Holy Rollers Studios and Programming Coordinator at Carlcew’s Pom Pom. This exhibition is funded by City of Adelaide. This exhibition is a part of the South Australian Living Arts festival.